These mugs are just a couple of experiments with slab building and brushwork. One day in class, my professor wanted me to show my classmates how I throw out a slab. She handed me a chunk of porcelain and we both started wedging, then each of us did a different technique to throw out a slab. I was able to get a slab almost 3 feet in diameter that was about 3/16″ thick. It was pretty good, even for me. The clay was really well-behaved. My professor just kept saying “Thinner, thinner!” so I kept throwing it until it started to wrinkle and I ran out of table space (the table was only 3 feet across). After that, she ripped both of our slabs into strips and put them in a press mold, took them out, and started throwing them at a wire to try and make them catch and drape– kind of like throwing a pair of tennis shoes over a telephone wire. It was pretty funny. She got the whole bunch of us laughing. While she was pressing pieces into the mold, I was messing around with another strip of the clay and I made one of my female figures really quick and rough. My classmates were impressed. Then someone randomly said “How would you make a bowl with it?” and I took up the challenge in the silliest approach I could think of. I grabbed a strip of clay, wrapped it in a circle, and pinched the bottom three or 4 times to take it in, like sewing. The base was narrow and it kind of looked like a bowl of sorts. Then to be even sillier and finish the job, I tore a small circle and put the bowl shape on top of it– giving it a base. A little while later after the professor demoed throwing a thin long slab to make a dog tongue, I used the same technique to make a handle and sloppily attached it to the bowl, making a large teacup. How does that story relate? You ask… well the sloppy bowl form got me to thinking. Why not take the idea more seriously and go with it– and make a few mugs? 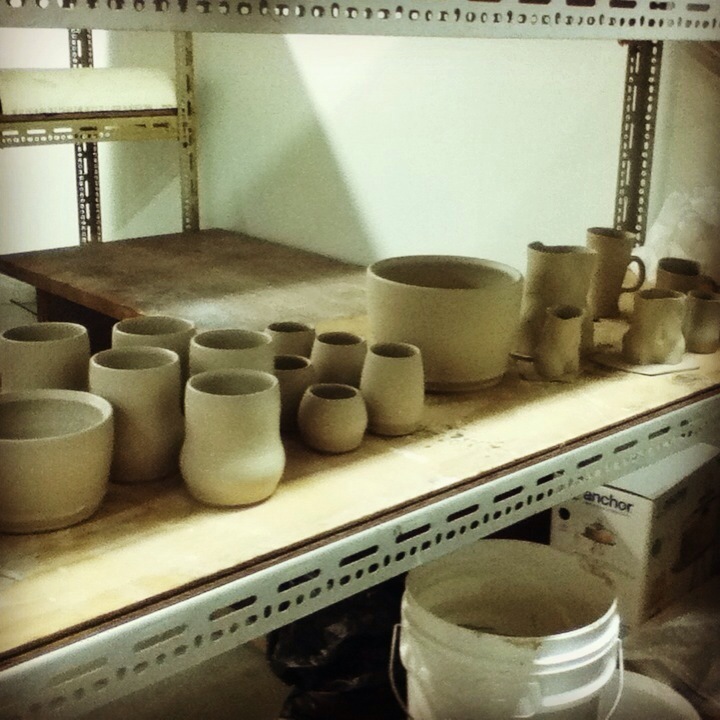 So these mugs are an example of a soft slab technique where I work more casually and welcome the clay to look like cloth or leather in the way the creases flow. On the back side of the shorter mug, there is a pinched fold like I was talking about. I’ve made more since, so I will have more new photos and you can eventually see what I’m talking about. 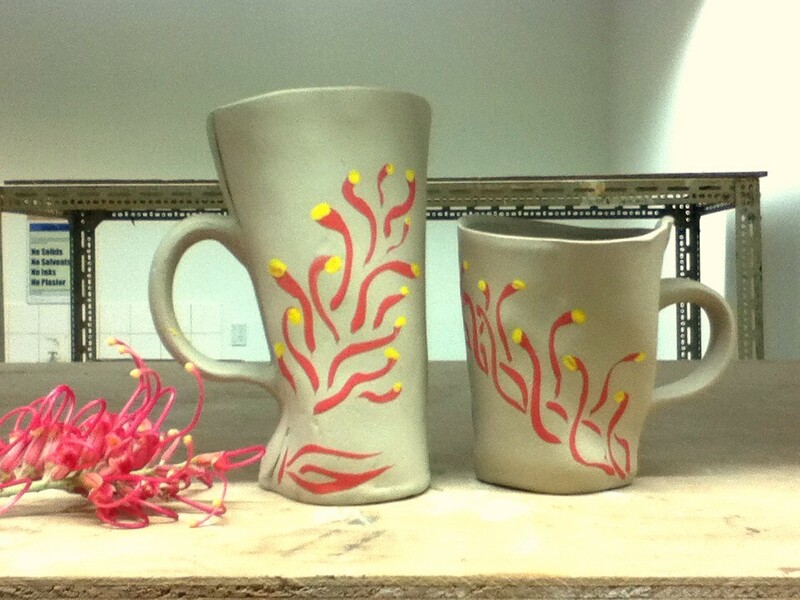 I painted grevillea flowers on these mugs– I went outside and picked one of the flowers halfway through decorating, which made me think to add the yellow to the tips of the flower. Grevillea flowers really are beautiful things. If you’ve never seen one in person, you should try to some day. This entry was posted in Art, Ceramics, Drawing, Nature, Painting, Sculpture, Uncategorized and tagged australia, ceramic art, grevillea flower, studio workings. Bookmark the permalink.